A war monitoring group and rescue workers said at least four people have been killed in the air raids against the last rebel stronghold in the country. The Britain-based Syrian Observatory for Human Rights described the airstrikes as the "most intense" since August when government forces began targeting the southern edge of Idlib province. The organization recorded 68 air raids in the southwestern Idlib town of Khan Sheikhoun, and other villages and towns in the province and in northern Hama. It said at least four civilians were killed, including two children and a woman, most of them in Abdeen, a village west Khan of Sheikhoun. 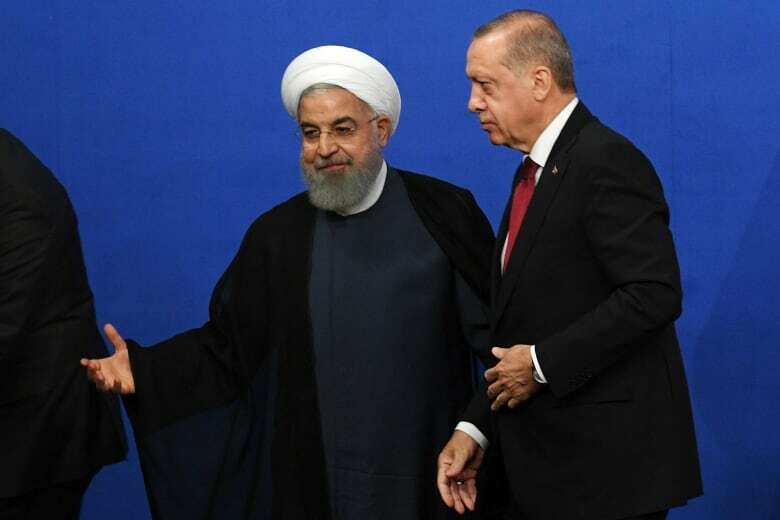 The intense air raids came a day after Iran and Russia backed a military campaign in the rebel-held area despite Turkey's pleas for a ceasefire. Turkey has troops and 12 observations points that ring Idlib. On Friday, Turkish President Tayyip Erdogan said his country could no longer afford to take in any more refugees from Syria. He spoke during a summit with the leaders of Russia and Iran in Tehran. Turkey has accepted 3.5 million refugees from Syria since the beginning of the seven-year war. Erdogan pledged in June to facilitate the return of refugees. State-run Al-Ikhbariya TV said the government was retaliating against overnight shelling from rebel-held areas on a government-held town in Hama province, south of Idlib. The shelling late Friday in Mhradah killed nine civilians, according to state media. But the government and Russian raids targeted a wide swath of rebel-held area in the southern edge of the rebel-held enclave that includes most of Idlib province and northern Hama province. Up to 30,000 rebel and jihadist fighters are thought to be entrenched in Idlib province. The local council of Morek, a town that serves as a crossing between Hama and Idlib, sent an urgent appeal, asking Turkey for a quick solution. "We need a quick solution or our town will burn!" the official pleaded in an audio recording shared on social media groups. Separately, clashes broke out in eastern Syria in Qamishli, a town close to the border with Turkey, between government and Kurdish security members. The Observatory said the clashes left 10 government security personnel and seven Kurdish fighters dead. The town is run by Kurdish-led administrators and forces, but Syrian government troops hold pockets of territory there, including the airport. Clashes rarely erupt there over turf control and authority, and are usually a reflection of deepening political tension between the uneasy partners. Kurdish security forces, known as Asayish, said in a statement that a government patrol entered the areas controlled by the Kurdish militia in Qamishli and began arresting civilians, then shot at a Kurdish checkpoint sparking the gun battle. The Asayish said seven of its members and 11 government personnel were killed. A journalist and resident of the area, Arin Sheikmos, said the government security troops went on an arrest campaign in Kurdish-controlled areas, detaining people it accuses of skipping compulsory military service. This prompted the clashes, which lasted no more than 20 minutes, Sheikmos said. There was no immediate word about the clashes from the government. The U.S-backed Kurdish administration has recently begun talking with the Syrian government — essentially seeking government recognition of its self-rule areas. But in recent days, the Damascus government announced it is holding local administration elections, including in Kurdish-ruled areas, undermining the negotiations and talk of Kurdish self-rule. The Kurdish-led administration control nearly 30 per cent of Syria, mostly in the northeastern part of the country, including some of Syria's largest oil fields. They seized the territories, with the backing of the U.S-led coalition, after chasing out Islamic State militants.